Topping concrete is defined as a layer of high strength concrete placed on an old, worn out concrete surface to provide a dense, abrasion-resistant surface, to increase structural depth and strength of the base concrete. Fig 1: Section of topping concrete over existing slab. In this article we study about the work procedure of laying topping concrete, its types and advantages. A preliminary assessment is required before the laying of topping concrete over an existing concrete surface. The existing concrete must be hard and strong. the base should be free of cracks as the topping concrete doesn’t bridge over the cracks of the existing concrete and by the passing time they may show up in the topping concrete too. Weak and fragile concrete bases are not preferred as they don’t achieve adhesion between the old and new concrete. This is the important step in the laying of topping concrete, as this ensures the proper bonding and adhesion of old and new concrete. The concrete surface on which the topping slab is to be laid must be uniform, clean and free from dust particles or other contamination. Prior if any topping concrete is laid , it must be completely removed. If the base concrete is finished smoothly then the surface must be made course by the help of mechanical scabbing or scarification machine , so that the course aggregate of the base slab is exposed. The loose debris, dirt and dust must be removed using a vacuum cleaner. 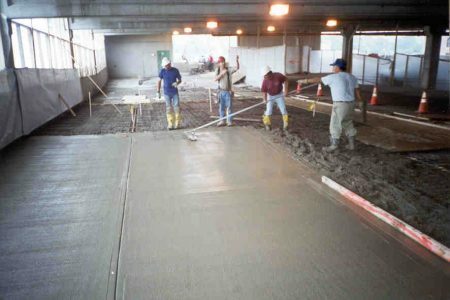 Fig 2: Surface preparation for laying topping concrete. The timing of preparing the base concrete is of very important . The base preparation must be done a day before to the placing of topping slab, in order to prevent any contamination or accumulation of dirt. Before placing the topping concrete, existing slab nature must be studied. A small amount of water is to be poured in the base slab and the absorption rate must be checked. If the water is absorbed in few minutes then the slab must be kept wet for 4 hours before placing the topping concrete and the water must be completely removed before just before placing. It is because once the wet concrete is placed in the base, all the water content of the concrete is absorbed by the base slab n the topping concrete is deficit of water. If no water absorption is seen, then the topping concrete can be laid as done in normal process. Commonly placed topping slab is in the range of 50-100 mm. Based on the thickness and the requirement of the topping slab, steel reinforcement is provided. The surface is first poured with the slurry made out of cement , sand and latex bonding agent. Before the slurry dries up, the concrete is placed. The concrete mix shall consists of aggregates. sand and cement depending upon the strength requirement of the topping. Minimum M20 Grade mix is to be laid. The type of finishing required for the topping concrete depends on many factors such as place, usage and surface requirement. If topping concrete is placed on the existing slab, then it is given rough finish for laying of flooring material. If the concrete is placed on floor concrete , it can be made as smooth finish. Fig 4: Finishing of topping concrete. Concrete has to be effectively cured if maximum surface strength, maximum resistance to surface abrasion and low impermeability of the concrete are to be attained, and the development of drying shrinkage cracks is to be avoided or minimised. Effective curing also reduces the effect of differential shrinkage, and therefore curling, by delaying the effect of differential drying until the concrete is better able to resist its effects. Curing must be done at least for minimum of 7 days. Topping concrete is differentiated into 2 types based upon the type of bonding that is formed between old and new concrete. The minimum recommended thickness is 1 to 2 in. (25 to 50 mm) for a fully bonded concrete overlay placed on a base slab that is practically free of cracks and in which the concrete is sound, clean, and of good quality. The use of welded wire fabric reinforcement is usually not warranted under these conditions. In general, cracks appearing in the existing base slab can be expected to reflect through bonded overlays. Placing conventional concrete overlays less than 1 in. (25 mm) thick requires using small aggregate (maximum size 3/8 in. (10 mm) or less) and a high sand content. Because of the high-water demand, these thinner-than recommended overlays shrink more than thicker overlays and are more likely to crack, de bond, and curl. Most thin-bonded overlays are placed to restore the wearing surface, not to add strength to the slab. This may be all that is needed to restore serviceability of light-duty floors. Although the formulas were developed for highway and airport pavements, they can be adjusted for use with floors. Unbonded construction with a minimum thickness of 4-in. (100-mm) is recommended if there are cracks in the base slab or if good bond is only partially attainable or totally lacking. 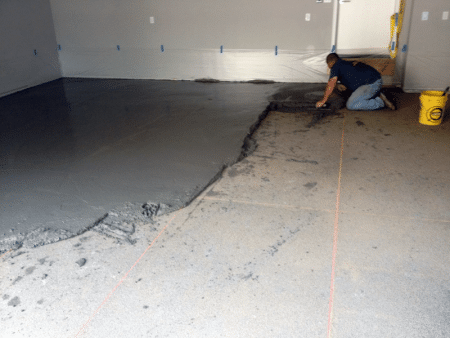 Both light- and heavy-duty floors can benefit from unbonded construction because the existing slab provides a good base for the new floor surface. These overlays are usually thicker than bonded overlays, and the higher final floor elevation may interfere with other service requirements such as doorway clearances. Even if cracks in the base slab are repaired, they may eventually reflect through a partially bonded overlay. 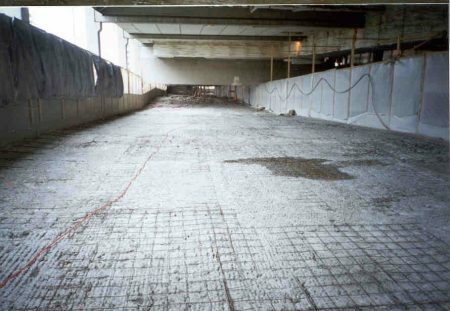 Properly designed welded-wire fabric reinforcement can hold the overlay slab together at any cracks that may form. Placement of the fabric in a thin, partially bonded or unbonded overlay requires special precautions to ensure that it is positioned at the proper level below the surface. Reflective cracking can be reduced by using thicker overlays. Reduced repair costs for finished construction.